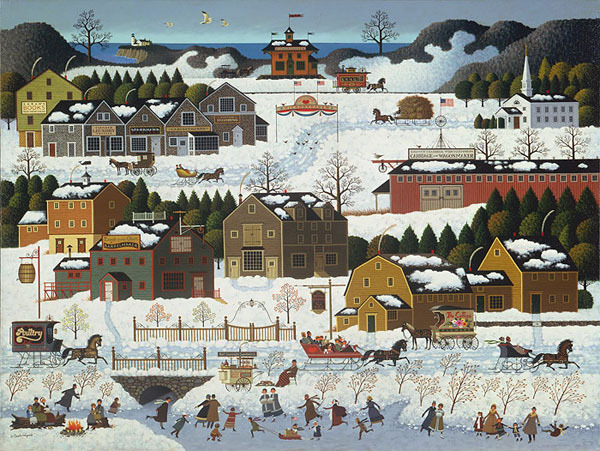 No one created a warmer winter scene than Charles Wysocki with his carefree and fantastic days as captured with a child’s eyes. Unlike Salty Witch Bay, Hickoryhaven Canal has real roots in Wysocki’s past. The memory was compliments of an uncle Charles who would visit in a cabin on the lake in upper Michigan, an area called Houghton Lake. When the snow fell and a canal behind the cabin froze over, the community would embrace the opportunity to enjoy winter at its finest. “Skating on the canal,” Charles recalled, “became a party from early morning until nightfall. People sang, played instruments, built fires, sold goodies and were obviously having a good time.” It was the perfect place to pass happy hours on a cold winter’s day. Winter is a time of warm and pleasant memories, and our Anniversary Editions of Hickoryhaven Canal will provide them year ‘round. Brilliant and dazzling at 30" by 40," our Masterwork™ Edition matches the size of the original painting. Our traditional Fine Art Edition of 24" x 18" will fit a smaller space just right. Hickoryhaven Canal is that perfect spot that exists in everyone’s imagination bought to life on canvas by Charles Wysocki.